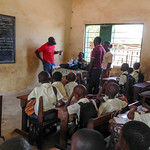 Bobby Smith has done a number of health screening and education sessions during his visits to Sierra Leone. At St. Anthony's School, he did blood pressure screening for the teachers while educating the kids about basic medical diagnostics. He's also done screening other locations around Freetown. Patients are referred to a local clinic if they need treatment. He even did a CPR demonstration for the fishermen on one of the fishing boats we donated.